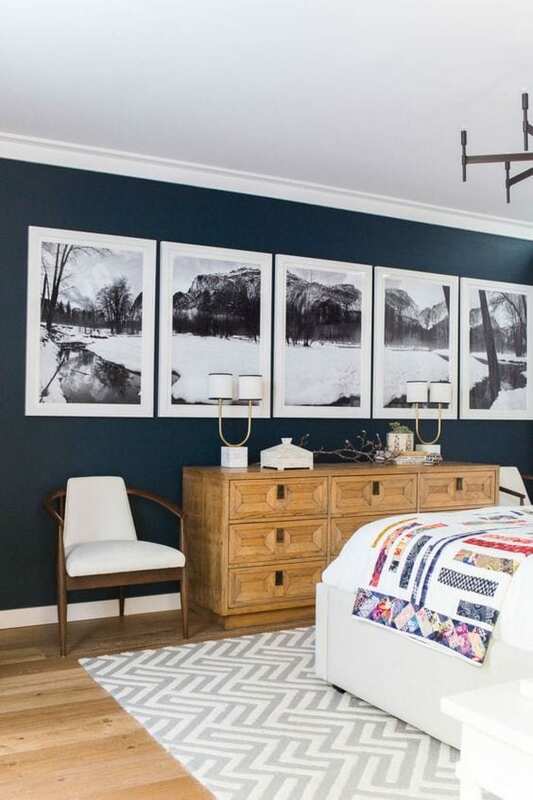 Check out these GORGEOUS master bedrooms with dark walls to inspire you that light isn’t always better. 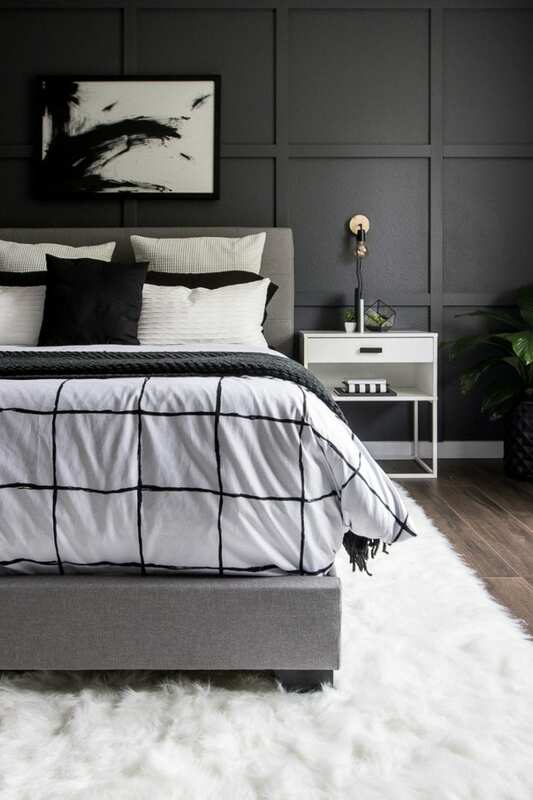 Ever since we started dreaming up the design plans for our monochrome modern master bedroom, I became obsessed with the idea of finding more dark and moody modern bedrooms for inspiration. I was nervous we might regret going with the high contrast and dark gray on the wall. I perused Pinterest for hours looking at inspiration. I was convinced that I needed to go light and bright because that is what it seemed everyone else was doing, but gosh, I am SO glad I went with my gut! 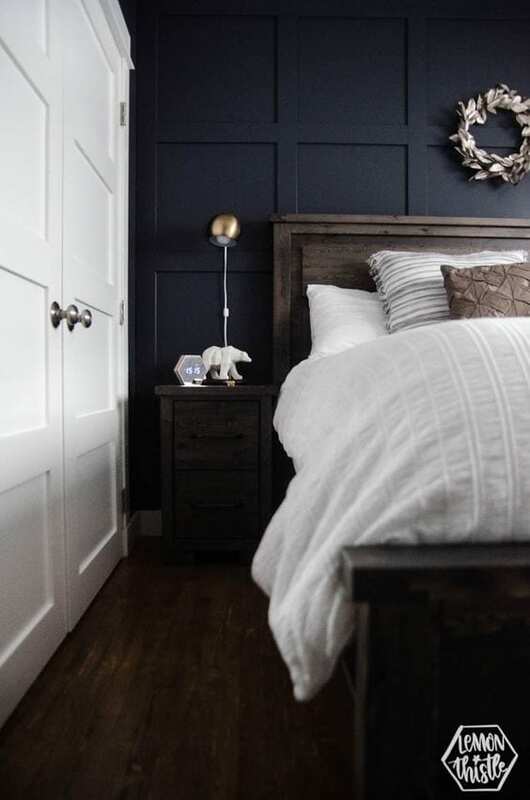 Today, I want to share with you some of my favorite master bedrooms with dark walls to inspire you as well. 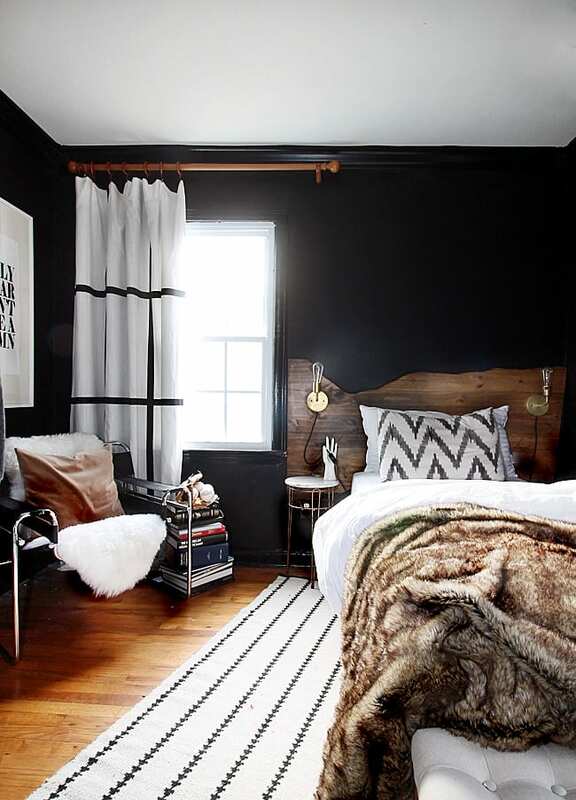 I love those exposed beams and the dark shiplap in this traditional chic bedroom! In another life with no kids and way less stuff, this would be my dream scandinavian bedroom! This bedroom is seriously stunning! 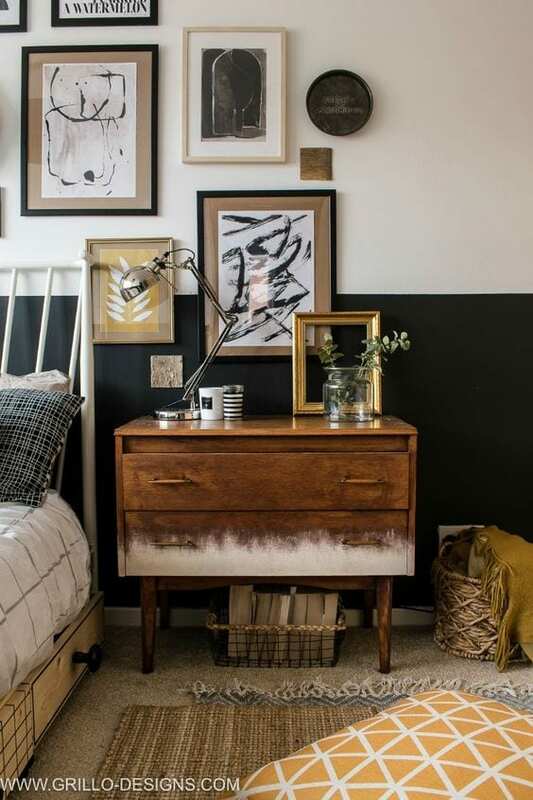 That headboard is incredible and I love the touches of eclectic you can see throughout the room. This modern bedroom with stark contrasting elements is stunning! Of course, I probably have to say that though since it’s mine. :) In case you missed your bedroom transformation, check out all the details here. Anything Studio McGee touches is perfection. This master is no exception. I love that open bed frame, dark wall, and exposed beams. The white against the dark wall is amazing! 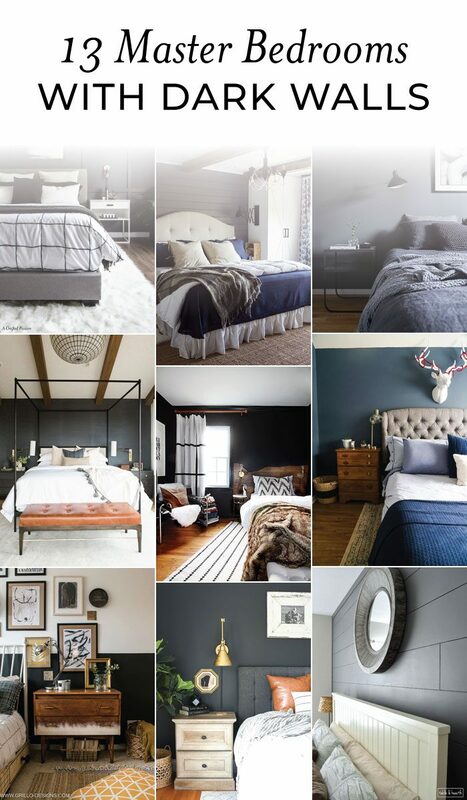 I love the gray tufted headboard against the dark wall. It’s different than the contrast you usually see and has some elements of farmhouse. 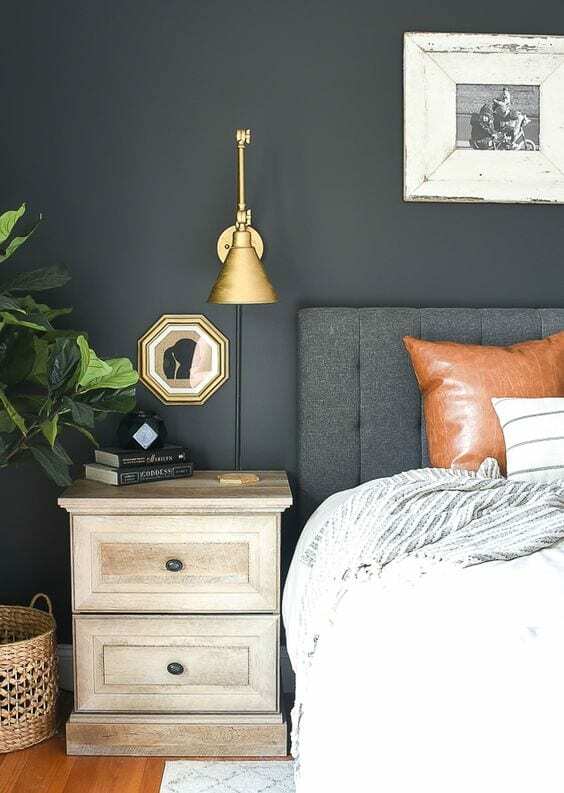 The gold and black accents help set the stage for this stunning bedroom. This wall isn’t super dark, but it’s dark enough I felt it was worthy to include. This room is perfect for the lake setting it’s at. And that picture mural is stunning! I love the simplicity in this rustic contemporary bedroom. Seems so relaxing to sleep in. 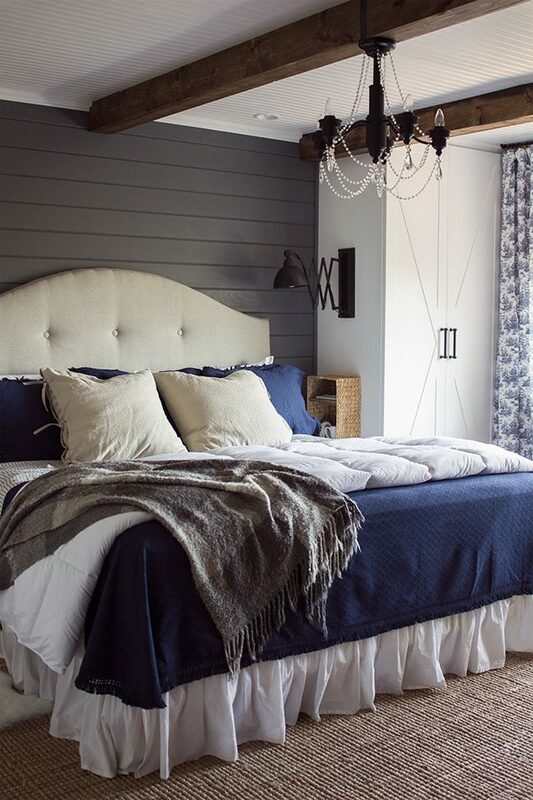 The small board and batten squares and rich wood accents in this navy bedroom are amazing! 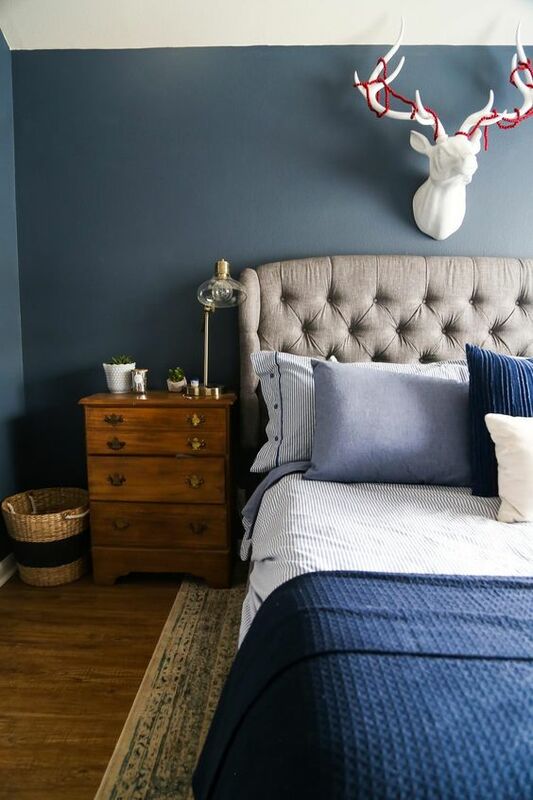 This small bedroom got an incredible makeover! 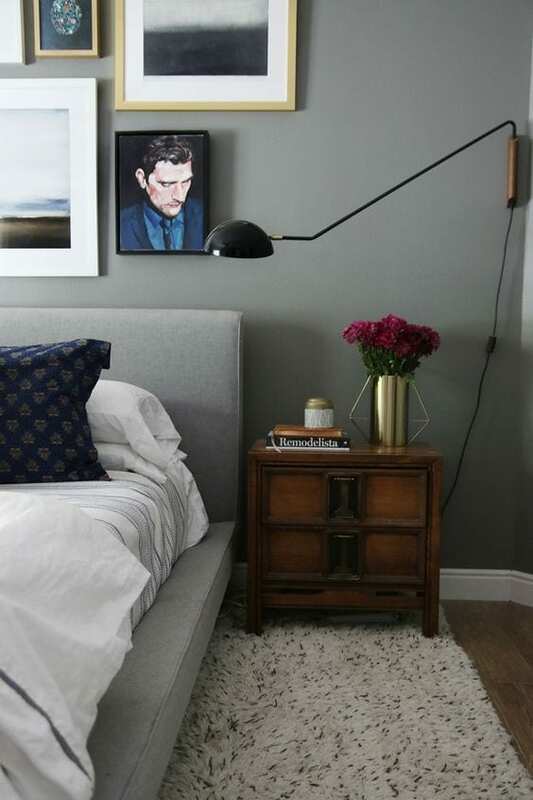 I love that simple nightstand effect with paint and the asymmetric gallery wall! This Hollywood glam bedroom has rich colors and bohemian elements in it. 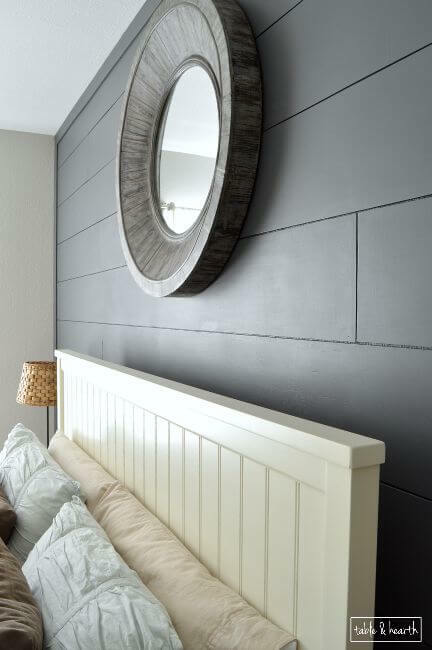 Again with the dark shiplap wall…I love how it contrasts the white headboard and creates a focal point in this coastal-inspired bedroom. Love! These master bedrooms all show off that you can have a similar feel with a completely different style. Going bold on the walls can be a risky choice, but if you plan well and know what you like, it’s definitely possible. 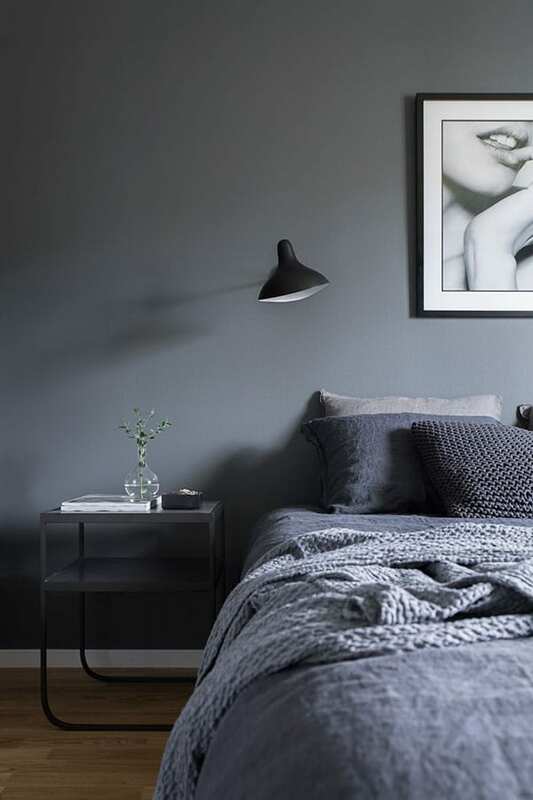 Which style of bedroom with dark walls is your favorite? I am still blown away by our bedroom. I just can’t believe it’s actually ours and not all a dream. 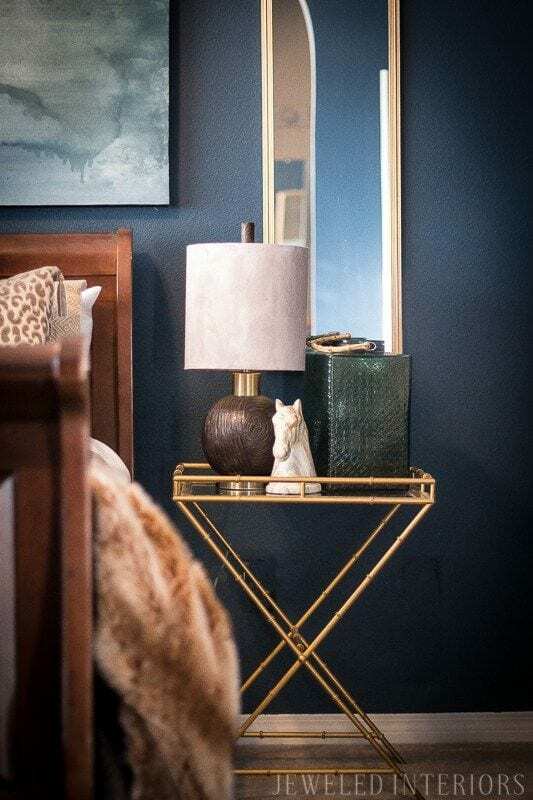 See all the moody details in our master bedroom reveal here.